What better place to enjoy a 'tale of the riverbank' than in the ancient market town of Tamworth. The Staffordshire town, which began as a Saxon settlement and later housed the palace of King Offa of Mercia, takes its name from the River Tame which runs through it. But Tamworth, which also boasts a magnificent Norman castle, was so prized as a location because it actually sits on two rivers. While the River Tame is the main watercourse running through the West Midlands, it actually merges with the smaller River Anker in the centre of what is modern-day Tamworth. So this was an ideal spot to take a riverside walk on a beautiful autumnal day. I set off from Tamworth town centre, taking advantage of the free parking available on Sundays. 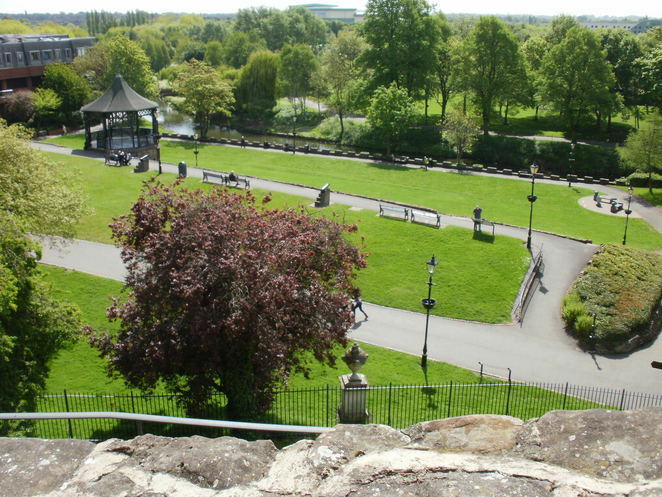 The setting off point was in the delightful Castle Grounds which lie in the shadow of Tamworth Castle, and just a short stroll from the modern Ankerside Shopping Centre, which takes its name from the River Anker. The birdlife was absolutely teeming, and not just the large numbers of Canada Geese and seabirds of various shapes and sizes. I also spotted ducks, coots, moorhens, swans and even a beautiful white heron perched on a fallen log near the spot where the two rivers meet. Clearly the heron and seabirds are attracted to the large numbers of fish in the rivers, which is the result of a decision by the Environment Agency to release no fewer than 10,000 fish into a stretch of the River Tame at Tamworth in December 2009 after it had been badly affected by pollution due to storms. It is also a very popular spot for anglers who have been fishing from the River Tame since the huge inflow of fish, with roach and chub said to be particularly abundant. I continued my walk along the Tame away from the town for about an hour, passing through flats and houses along the river's edge with occasional innovative artwork on the way, such as a metallic relief of swans. Once back in the town centre I took a slightly different route and, in doing so, came across a series of sculptures signifying the planets of the solar system, deliberately laid out to illustrate their respective distance from the sun. And, speaking of the sun, there was enough of it left in the afternoon to sit on a bench in the Castle Grounds overlooking the river to enjoy the birds passing by.